Washington D.C., September 25, 2018 - Possibly for the first time in U.S. diplomatic history, the nuclear “Football” became a subject of a heads-of-state discussion when Russian President Boris Yeltsin proposed getting “rid” of it during a meeting with U.S. President Bill Clinton in September 1994. According to a recently declassified meeting record published for the first time by the National Security Archive, Clinton discouraged the idea on the grounds that the Football was an important symbol of civilian control of the military. Yeltsin brought up the idea again in a 1997 meeting and Clinton administration officials gave a similar response. 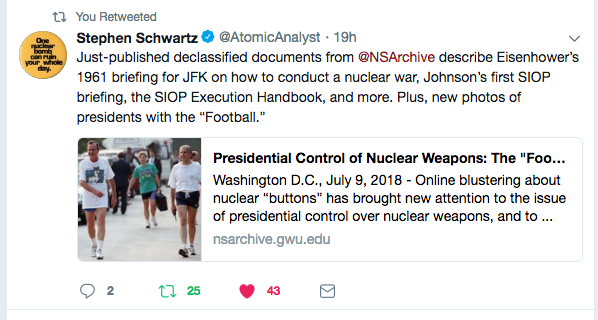 The new documents update our previous posting on the Football and complement other materials on presidential control of nuclear weapons on the Archive’s web site. 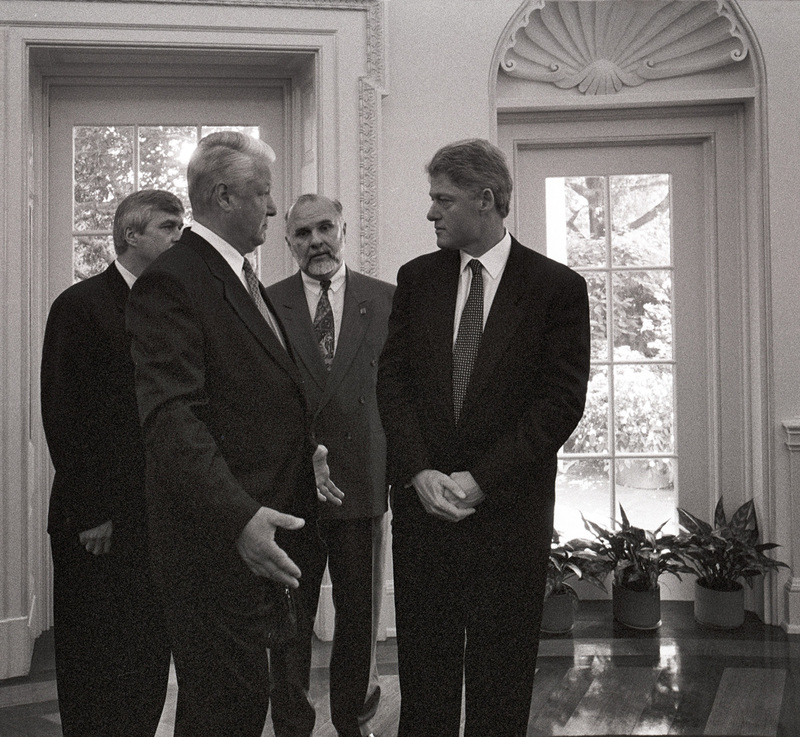 U.S. President William J. Clinton and Russian Federation President Boris Yeltsin during their meetings at the White House on 24 September 1994. Standing between them is U.S. interpreter Peter Afanasenko. 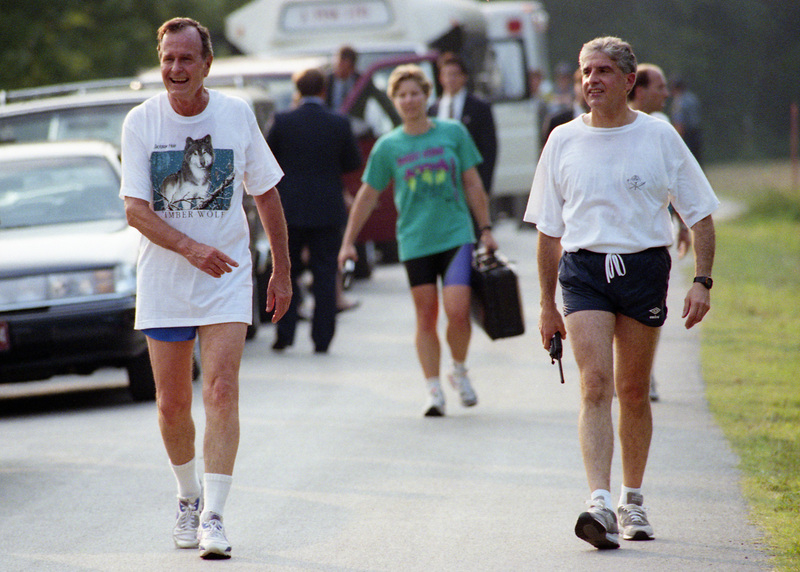 (Photo courtesy of William J. Clinton Presidential Library). 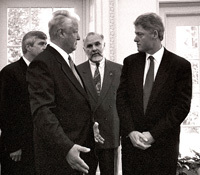 The “Football,” the nominally secret command-and-control system used to assure presidential control of nuclear use decisions, was the unusual subject of high-level discussion between President William J. Clinton and Russian President Boris Yeltsin during meetings in 1994 and 1997. According to recently declassified memoranda of conversation (memcons) published for the first time by the National Security Archive, Yeltsin suggested getting “rid” of the Football, so that military aides no longer had to “drag” it around. He saw the U.S. Football and the Russian equivalent (“chemodanchik”) as obsolete because of the advanced communications technologies that presidents had at their disposal. Besides the Football, the Clinton-Yeltsin meetings included discussions of the North Korean nuclear negotiations, tactical nuclear weapons, submarine incidents at seas, missile sales to India and Iran, and relations with Iran. Possibly considering the Football as a symbol of superseded Cold War rivalries, Yeltsin may have seen his proposal as a way to develop a U.S.-Russian partnership. But neither Clinton nor Vice President Al Gore were receptive, only agreeing that it needed study. 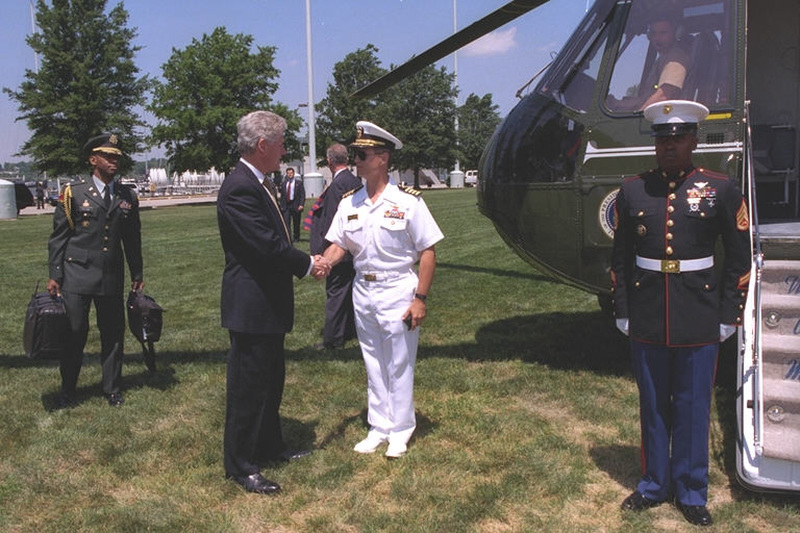 Gore implied that the Football might be necessary because nuclear proliferation was posing more dangers and “deterrence [had] a new orientation.” The implication was the need for presidential readiness in the event of a surprise attack from a new proliferant, Clinton raised the Football’s “symbolic importance”: the need for a “double check that only a civilian, elected leader can make [the] decision” to launch nuclear war. In the back of his mind, Clinton may have considered the domestic political risk (looking soft on defense!) of ending an arrangement used by presidents since Eisenhower. Possibly confusing the Football with the Hotline, Yeltsin said it was unnecessary “to have our fingers next to the button” because “we have plenty of ways of keeping in touch with each other.” When he proposed that the “chemodanchik” (the Russian term for their Football) did not have to be carried around, Clinton once more said he would have to “think about this” and asked Deputy Secretary of State Strobe Talbott to comment. Taking the principle of civilian control of the military as his subtext, Talbott observed that it was better for presidents “to have these devices with you at all times rather than to have the function assigned to a computer somewhere or to anyone else.” It would not be necessary to worry about nuclear weapons control, Clinton declared, “if we do the right thing in the next four years” and reduce the nuclear stockpile further. Washington D.C., July 9, 2018 - Online blustering about nuclear “buttons” has brought new attention to the issue of presidential control over nuclear weapons, and to the special satchel or “Football” of emergency and nuclear planning information carried by White House military aides when the President is traveling. Declassified documents published today by the National Security Archive describe the Eisenhower, Kennedy and Johnson arrangements for the “Football”; and the posting includes newly discovered White House photographs of six recent Presidents with military aides and the Football nearby. The on-line discussion of "nuclear buttons" during the Korean crisis has deepened concern about the problem of presidential control of nuclear weapons and whether a president can initiate a nuclear war over the doubts and opposition of top civilian and military advisers. 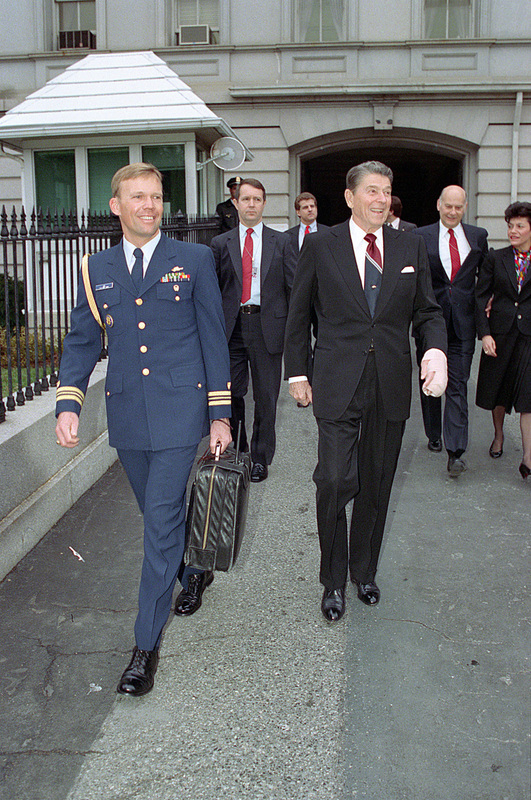 Symbolizing the reality of presidential control is the “Football,” the special briefcase that contains information on U.S. war plans and emergency procedures, carried by a military aide whenever the President is outside the White House, whether at a Washington, D.C. location or traveling on Air Force One or Marine One. Variously known as the “emergency kit,” the “President’s Black Bag,” the “satchel,” or the “suitcase,” the Football and the military aide carrying it are near the president’s side in the event of a terrible crisis, such as a nuclear attack, so that the president has the information and the communications arrangements needed to make a timely decision. 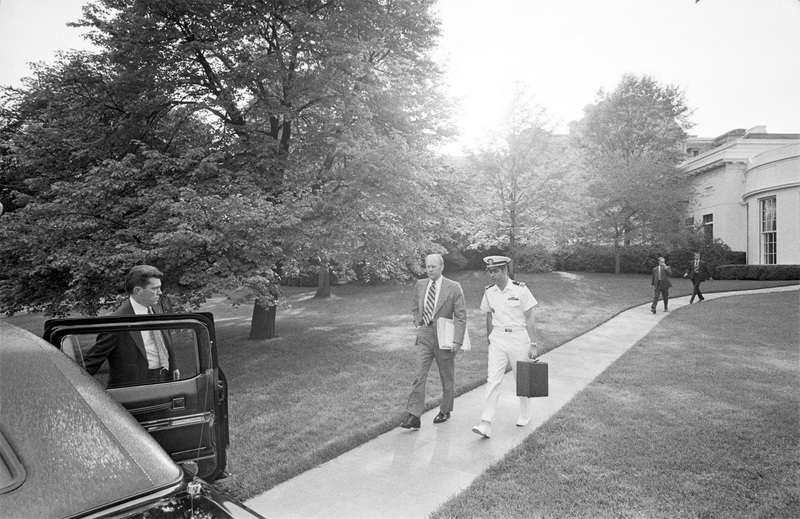 Today, the National Security Archive publishes for the first time a variety of declassified documents discussing the procedures and a wide array of White House photographs, from the Kennedy administration to the Clinton administration, showing military aides carrying the Football standing by or walking near the president. 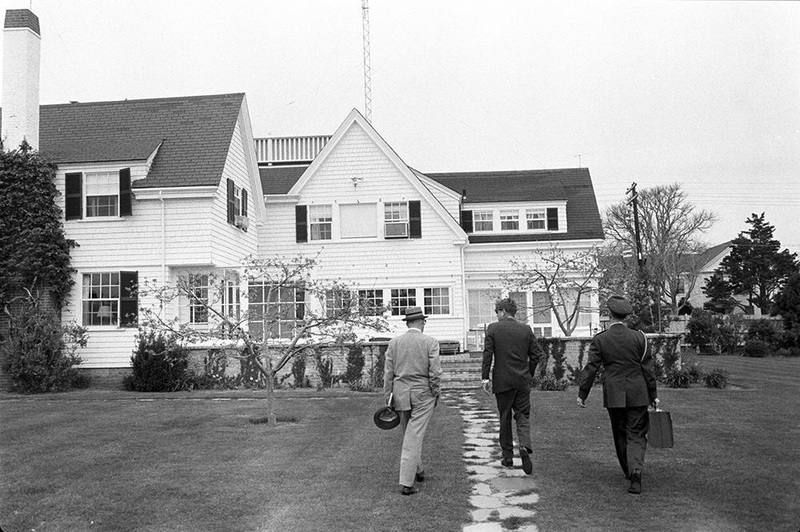 It is not clear when or why the “Black Bag” became known as the Football, but during the Eisenhower administration it became the practice, when the president was traveling, for a military aide to carry a briefcase including emergency action documents, such as presidential proclamations and information on authorization of nuclear weapons use. An aide was also assigned to Vice President Richard Nixon in the event that something happened to the president. A number of important developments made Football-type arrangements important both to the president and the Pentagon leadership. The emergence of a Soviet ICBM threat in the late 1950s greatly reduced warning time and the need for rapid decisions in a crisis made it important to establish procedures for convening emergency conferences between the president, the secretary of defense, and the Joint Chiefs of Staff. Moreover, the creation of the Single Integrated Operational Plan (SIOP) in the early 1960s, soon gave the president (or a successor) a menu of preemptive or retaliatory nuclear attack options. The Football came to include the “SIOP Execution Handbook,” with detailed information on the strike options. A Pentagon memorandum from November 1962 on an “Emergency Actions Folder” forwarded to a White House Naval aide concerning actions that could be taken under various Defense Readiness Conditions [DEFCONs]. Documents from 1963 on the making of the “SIOP Execution Handbook,” created expressly for the president’s use in a crisis and one of the major items in the Football. Documents from 1964 on the Joint Chiefs of Staff’s creation of the “Gold Book,” the renamed emergency actions folder, for inclusion in the emergency satchel. Memoranda from 1964 on President Johnson’s first briefing on the nuclear war plans, the Single Integrated Operational Plan (SIOP), with White House military aides among the listeners. A draft memorandum from early 1965 suggesting that President Johnson did not like to “be followed so closely” by a military aide carrying the Football and that he wanted other arrangements. Manchester’s sources described the black bag’s contents: launch codes, contact phone numbers for the British prime minister and the president of France (with whom U.S. presidents had agreed to consult, if possible, when making nuclear weapons use decisions), and information on nuclear strike options. According to Manchester’s account, the presentation of the latter “looked like comic books… because they had been carefully designed so that any one of Kennedy’s three military aides could quickly tell him how many casualties would result from Retaliation Able, Retaliation Baker, Retaliation Charlie, etc.” This may not be wholly accurate: the satchel may not have include launch codes, which were closely held at the Pentagon, but it did include authentication information needed so the president could communicate with the JCS war room and issue nuclear strike orders. Neither Horton’s nor Manchester’s account mentioned the Emergency Action Papers. More information reached the public in 1980 when William Gulley, the former director of the White House Military Office, published a memoir, Breaking Cover. Gulley’s book was controversial in part because it included sensational charges about White House spending abuses, but it included interesting points about the Football. One was that most presidents had not been very interested in it and seldom asked for updates about the Football’s changing contents (changes in strike options, targeting, etc.). Gulley further observed that there was “a kind of mythology” that the Football is an “ever ready Answer Box” for presidential action in a crisis. “The truth is that it raises as many questions as it answers.” Gulley explained that if the United States was under attack, the president would have to quickly make complex decisions in minutes about retaliatory options. The implication was that the information in the Football was so complex and demanding that few presidents had the background needed to make sound decisions in a crisis. From all accounts President Jimmy Carter immersed himself in the details of nuclear planning so it is possible that he became conversant with the Football’s contents, including the SIOP handbook. Yet as far as this writer knows, no substantive information about his or other presidents’ briefings about the Football has been declassified. One of the few pieces of declassified information concerns the Reagan administration: a few days before the inauguration, White House military aide Major John Kline briefed president-elect Ronald Reagan about White House emergency communications procedures “in the event of an attack.” Later in the year, on 16 November 1981, Kline provided “additional detail regarding the ‘black bag’ that the aides carry – and its role in the strategic release process.” Yet as far as this writer knows, except for the briefing to John F. Kennedy [See Document 1], substantive information about the briefings for presidents, much less the “Football’s” specific contents, remains secret. Additional research and declassifications may shed more light on the history of the Football, presidential briefings about it, and how its contents have changed over the years. The memorandum that General Goodpaster prepared of the briefing for president-elect Kennedy is exemplary for providing some information about the “satchel’s” contents. Whether comparable records of related briefings during subsequent presidential transitions were prepared needs further investigation. 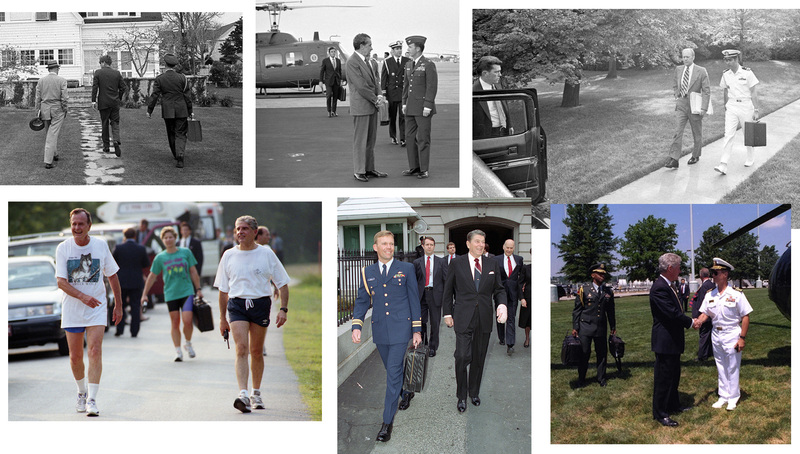 The photos of U.S. presidents with a military aide carrying the Football or “Black Bag” or “satchel” in the same frame are familiar to many readers. This posting includes a number of those photographs as described below. Yet, for some recent U.S. Presidents it is not easy to find such photographs. So far, the highly diligent archivists at the Lyndon B. Johnson Presidential Library and the Jimmy Carter Presidential Library have been unable to find any such photos because they apparently do not exist. For President Kennedy, only one photo has surfaced and only a handful from the Richard Nixon administration. By contrast, archivists at the Ford, Reagan, Bush I, and Clinton administrations were able to identify relevant photographs without significant difficulty. It partly depends on how the Presidential Library indexes the photographs and whether the archivists can search for a term such as Football as they can, for example, in the indexes to the Ford Library’s databases of photographs. For the Bush II and Obama administrations, White House photographs are not yet available to the public, but images of Football holders have appeared in the mass media, for example, this photograph taken during the Obama administration. Early in the Trump administration, a visitor to Mar-a-Lago engaged in conversation with a Football holder and took photographs showing the military aide in the president’s retinue. 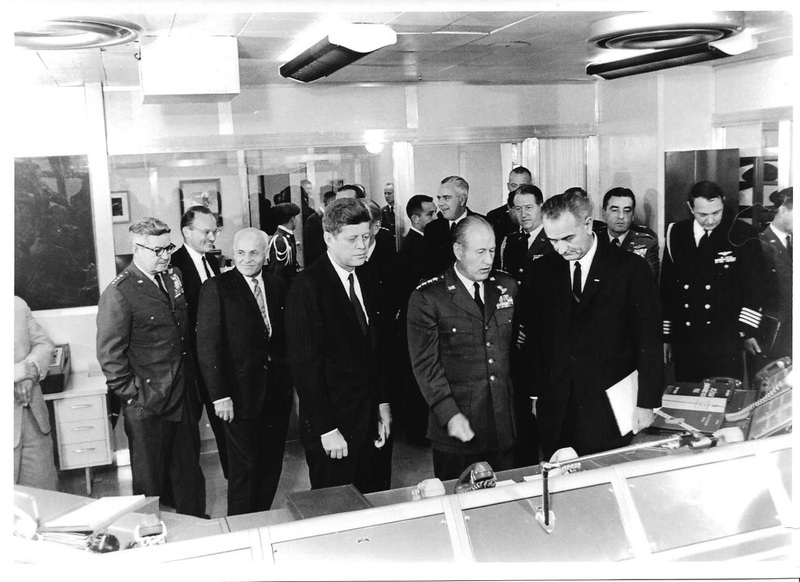 During an inspection tour of defense installations in the western U.S., President Kennedy visited the underground command post at Strategic Air Command headquarters on 7 December 1962. In the first row: President Kennedy, Commander-in-Chief Strategic Air Command General Thomas Power, and Vice President Lyndon B. Johnson. Standing behind Kennedy, Power, and Johnson, are Air Force Chief of Staff General Curtis LeMay, National Security Adviser McGeorge Bundy, Secretary of the Air Force Eugene Zuckert, Chief of Naval Operations Admiral George W. Anderson, and Air Force aide to the President General Godfrey T. McHugh. Just to LBJ's right are Senior Military Aide to the President and sometime Football carrier General Chester V. Clifton, and Naval Aide to the President Captain Tazewell T. Shepard. 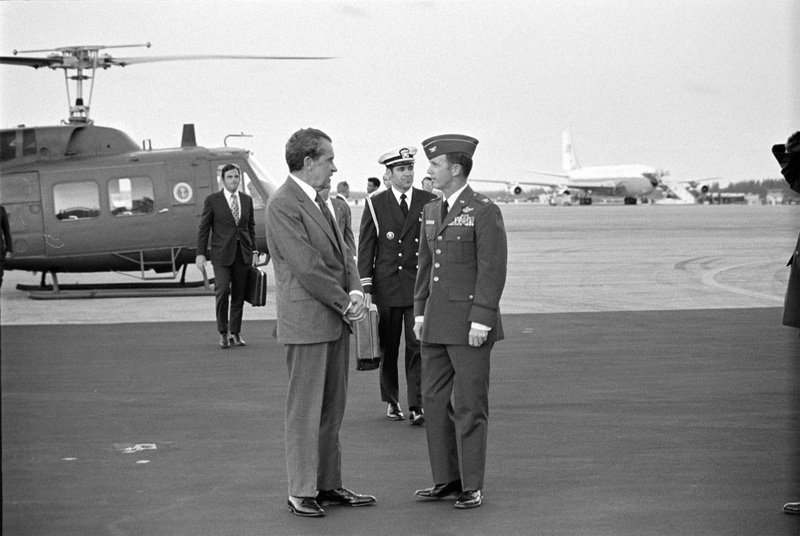 (Photograph ST-335-15-62, John F. Kennedy Presidential Library). 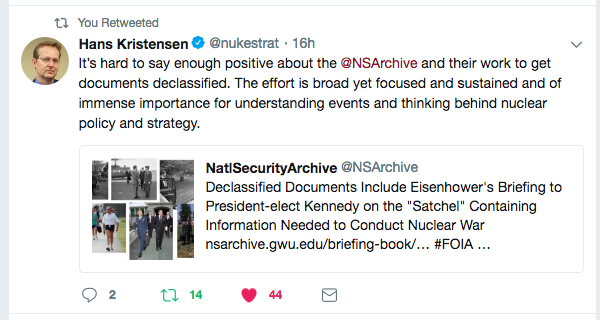 See for example, Bruce Blair, “Strengthening Checks on Presidential Nuclear Launch Authority,” Arms Control Today, January-February 2018; Alex Wellerstein, "No one can stop President Trump from using nuclear weapons. That's by design." Washington Post, 1 December 2016; Alex Wellerstein and Avner Cohen, "If Trump wants to use nuclear weapons, whether it’s ‘legal’ won’t matter": Washington Post, 22 November 2017, and Amy Wolf, “Defense Primer: Command and Control of Nuclear Forces,” Congressional Research Service, 1 December 2016. The very useful print and on-line discussion of the Football and its history frequently asserts that “Football” derives from a code word, “Drop-kick,” either for the first SIOP or an early U.S. nuclear war plan. The implication is that a drop-kick required a football. That may be the case, but no evidence supports this claim. There is no evidence of a U.S. war plan code-named Drop-kick, although a special study of war planning requirements was code-named DROPSHOT while the code-name of another one, OFFTACKLE, referred to a football play. The only place where a reference to “Drop-kick” can be found is in a statement by General Buck Turgidson in Stanley Kubrick’s 1964 black comedy Dr. Strangelove: How I Learned to Stop Worrying and Love the Bomb. Bob Horton, “Instant Nuclear Readiness; ’Box’ Follows President,” The Baltimore Sun, 21 November 1965. Thanks to Alex Wellerstein, Stevens Institute of Technology, for providing a copy of this fascinating article. William Manchester, The Death of a President November 20-November 25 1963 (New York: Harper and Row, 1967), 62-63, 261, 321. Billy Gulley with Mary Ellen Reese, Breaking Cover, (New York: Simon & Shuster, 1980), 15, 187-190, 193; also cited in Daniel Ford, The Button: The Pentagon’s Strategic Command and Control System (New York: Simon & Schuster, 1985), 89-90. It is worth noting that White House military aides have played a wide variety of roles. depending on the wishes and the personal style of the president whom they served; carrying the Football has been only one responsibility. Charles H. Mead, an Air Force aide during the Ford administration, recalls any number of tasks, including serving as advance man for speeches, setting golf-tee times, making sure Ford’s favorite pipe tobacco was at hand, and setting up arrangements for an upcoming International Summit. E-mail to editor from Charles H. Mead, 29 June 2018. On Carter’s interest, see Daniel Ford, The Button, 26-27, and Garrett M. Graff, Raven Rock: The Story of the U.S. Government’s Secret Plan to Save Itself- While the Rest of Us Die (New York: Simon & Schuster, 2017), 248, 250-252. This important document is cited in David F. Krugler’s valuable study, This Is Only a Test: How Washington D.C. Prepared for Nuclear War (New York: Palgrave Macmillan, 2006), 169-171 and 232, note 5. Dwight D. Eisenhower, Waging Peace, 1956-1961 (Garden City: Doubleday & Company, 1965), 617. According to Goodpaster, underlying the emergency orders was the assumption that “martial law, martial rule” would be in effect. See Krugler, This Is Only a Test, 162. Shepard’s questions were first quoted in Scott Sagan’s The Limits of Safety: Organizations, Accidents, and Nuclear Weapons (Princeton, NJ, Princeton University Press, 1993), at 149. See also Marc Trachtenberg, A Constructed Peace: The Making of a European Settlement, 1945-1963 (Princeton: Princeton University Press, 1999), at 294. Johnson’s preferences in this area are corroborated by other sources; see Garrett M. Graff, Raven Rock, 177. His apparent aversion to the presence of military aides nearby may have had something to do with his determination to “lower the military presence” in the White House, which he saw as excessive, and to replace, without firing outright, General Clifton and others in the Military Office whom he saw as being part of the Kennedy crowd. See Gulley. Breaking Cover, 47-49. By contrast, Johnson apparently did not mind having his own man, Col. James U. Cross, Clifton’s successor, carrying the Football, close at hand, during a flight across New Zealand in October 1966. See James U. Cross with Denise Gamino and Gary Rice, Around the World With LBJ: My Wild Ride as Air Force Pilot, White House Aide, and Personal Confident (Austin: University of Texas, 2008), 112.